Scroll down to below John's post to see Peter's thought processes on this little vase. My name is John and I currently live in Omaha, Nebraska. I recently acquired a small, glazed brown stoneware vase with what appears to be an Asian name or signature on the bottom and four markings or decorations on the side of the vase that look somewhat like a partial circle with an “x” inside. The mark on the bottom of the vase does not seem to be any Chinese or Japanese character that I recognize or can find, but it does look like an Asian mark, name or signature to me – I could be way off on this one. The vase in question is between two and three inches tall, and about the same width with a small flared opening at the top. It is glazed with two different colors of brownish glaze. The stoneware is a bit thick as would be expected – not thin like a porcelain vase would be. If I had to guess, I would say that this vase is not that old. The unglazed portion of the bottom seems very clean. I purchased this cute little vase at an estate sale today (06 August 2016). No known history. No one could tell me anything about the vase. 1. 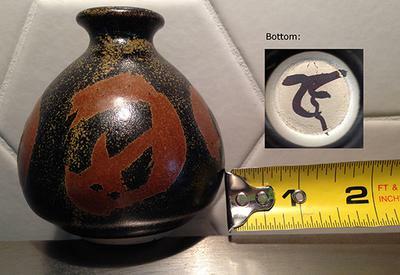 An image of the bottom of the vase with the large flat side up and the point down. 3. An image of the mark only (on a white background) with the large flat side up and the point down. 4. An image of the mark only (on a white background) with the point up and the large flat side down. 5. An image of the side of the vase – a pretty much straight on photo. I tried to an image search on this site but could not figure out how to do so. I did read through the posts on this site and looking at anything that might be a possibility – again with no success. Not knowing what the mark is or how to describe it. Enjoy the vase and accompanying information all the more. While the acquisition of the information I desire (maker and approximate date), would be nice, I purchased the vase because I like and an will enjoy it regardless of the outcome of my search. Sometimes, but not too often as I can usually find what information I desire quickly or give up the search. This is my first time on this website. I am hoping to learn to navigate and use the site more often. - If you have a store or ebay shop, give it a mention. I do not have a store or shop on eBay, but thanks for the suggestion. Comments for Can you Help Identify this Small Stoneware Vase with narrow neck and bulbous shape? Nice little item. Great submission, thanks. Definitely oriental of some sort, your gut feeling was right methinks. When I did my power Googling, I saw this type of small vase being labelled as a 'weed pot' - narrow neck, short bulbous shape. Apparently, a big trend in the 1970's and 80's to dry herbs and wild weeds for display (hopefully not for other illegal purposes !!!!). Next, I looked up incense jars as I have seen small Japanese pots with narrow necks labelled as being part of a Japanese incense set. It really does look like Japanese type styling on this - it doesn't really look particularly Chinese. But this style of decoration is unfamiliar to me and I couldn't find anything else remotely like it - as a 'style'. It doesn't obviously fit the better known Japanese styles like Satsuma, Kutani, Arita, Imari, Seto, Kakiemon etc. I can't recognise the marking unfortunately, but you might want to shoot through to Gotheborg.com Japanese marking section and scroll down to see if you can pick a similar mark. Please report back if you find anything. Otherwise, it might be Western Japonism, paying homage to everything Japanese, maybe made by a hippy potter in California. Either way, it's a great mystery query which we need to solve fast. I favour it being a smaller studio kiln in Japan, active a few decades ago, possibly allied to a retail outlet - which would be pretty well known regionally, but perhaps not so much so internationally. The sort of place a visitor to Japan might to be tempted to buy a tasteful souvenir as a nice gift - or received as a gift from a Japanese friend in that prolific gift-giving culture. If we could get someone who could read the mark, that would be terrific as this is all guesswork on my part. I would be interested to know how accurate my sleuthing flights of fancy are. Pleased to have someone chip in on this one. I doubt that the jar is old. I was thinking about 1970's or 80's. Is that what you think too? Yes, I doubt it is Japanese though. Probably Chinese. I'd love know your thoughts on this piece. Why do you think Chinese? I sent the mark to a friend in Japan. Thank you everyone for all of the information. It is a nice little pot and I'll enjoy it regardless of the information I have. Thanks again for all of your work and comments.